Invisalign treatment is an alternative to traditional braces. The innovative alternative uses a series of clear and removable aligners to align the teeth. It is the perfect option for teens and adults, for improving their smile. Nevertheless, to achieve the desired smile, the aligners need be worn for 22 hours a day. However, can be removed for brushing, flossing, special events and eating. Invisalign can treat mild to moderate orthodontic issues including, gapped teeth, crowded teeth, overbite, underbite, and crossbite. Although convenient, Invisalign may not be recommended if you have severe orthodontic problems. Invisalign and braces were both designed to straighten teeth while improving oral health and your smile. Braces are metal brackets glued to your teeth which are tied together by wires and rubber bands. Moreover, to make the braces appear more discreet, you can choose brackets to match your enamel color. Or, to make a fashion statement with your mouth, you can even get them in color. However, Invisalign is designed to be invisible. The aligner trays are made of smooth and comfortable BPA free plastic. The aligners are worn over your teeth to gently and subtly move your teeth. The aligner trays are configured accordingly through X-rays, pictures, and impressions to create a precise 3D image of your teeth. 20 percent of all orthodontic patients are adults. However, even though your teeth may be more firmly rooted in their place when compared to an eleven-year-old, it is possible to move your teeth into a more aesthetically pleasing and functional alignment. Invisalign braces are a solution that works just as well as regular braces. Most people usually tend to start off their dental treatment with Invisalign because they are self-conscious about their appearance. Though, the truth is, no one will be able to tell that you’re wearing Invisalign unless you notify them that you are. However, even though it may take a while for you to adjust to the feeling of wearing Invisalign and it may be difficult for you to speak over the first few days of wearing aligners, your mouth will eventually get used to the extra bulk around your teeth. But, the solution is far less noticeable than having metal wires running across your front teeth. The maintenance of Invisalign is much easier than maintaining metal braces. The process is far less complicated, compared to if you had brackets and wires, even though it requires for you to brush your teeth after eating and before putting the aligners back into your mouth. You can simply remove them before each meal, brush your teeth thoroughly and put them back in your mouth to continue with the treatment. One of the most prevalent complains from patients regarding braces is that good gets stuck in the brackets and wire. The construction and position of the brackets make it very likely for food particles to collect. However, Invisalign is to be removed before eating. Therefore, your Invisalign aligners will always be food-free. Invisible aligners are designed to straighten your teeth more gradually. Patients usually find their experience with Invisalign less discomforting as compared to patients who are wearing metal brackets and wire. The adjustment period is much shorter, and there are fewer mouth sores related issues because there are no rough brackets or edges to the aligners, reducing the patient’s discomfort. Even though Invisalign do require you to meet with your orthodontist, once every few weeks, the likeliness of having lesser meetings is very high, as compared to those wearing conventional braces. Why? The probability of broken and jolted out of alignment brackets and wires decreases with the use of Invisalign aligners, and there are a very few issues that can go wrong with invisible aligners. Perhaps, because they are worn for only two weeks till the patient is required to switch to a new set of aligners. Therefore, the likeliness of having severe problems decreases, reducing the number of emergency visits to the orthodontist. Braces can be used for the treatment of some orthodontic cases. One of the few cons of invisible aligners is that it can only be used for the treatment of mild and moderate crowding, at this point and patients with more severe problems need to opt for the conventional therapy. However, as aligners are evolving, more cases will be able to be treated. Invisalign are to be worn for 22 hours per day for maximum results. The aligners need to be removed before eating or drinking anything besides water. Moreover, after eating you need to clean your aligners and brush your teeth before putting them back in your mouth. It sets a limit on your eating and snacking. It can be a bit of a pain for patients who snack at small intervals of time. 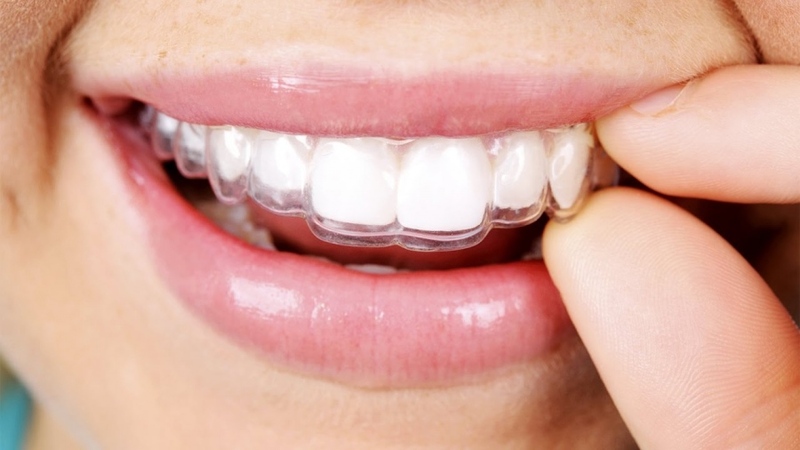 The first Invisalign were sold in 1999 in the US. They haven’t been around for as long as the conventional orthodontic treatments. Therefore, it isn’t a time-tested treatment to straighten teeth. It can be very tempting to relinquish wearing the aligners for a few hours. But, for the best results, you need self-discipline. Unlike fixed orthodontic appliances, Invisalign is easy to misplace. You need to be very consistent about storing them in their case. Taking care of the aligners is more problematic for younger patients. If you’re looking into getting Invisalign aligners, you should be aware of the fact that to do the job efficiently, aligners sometimes require enamel colored attachments. The attachments are cemented to the teeth throughout the treatment. They almost look like clear braces in your mouth.